The Sanskrit word sneha means both “oil” and “love, ” and the effects of abhyanga are similar to being saturated with love. Both experiences can give a deep feeling of stability, warmth and comfort. 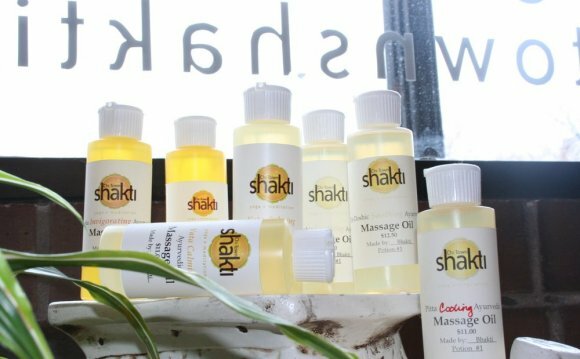 Sneha – oil and love – is sukshma, or “subtle.” This allows it to pass through minute channels in the body and penetrate deep layers of tissue. Ayurveda teaches that there are seven dhatus, or layers of tissue in the body. Each is successively more concentrated and life-giving. It is taught that for the effects of sneha to reach to the deepest layer, it should be massaged into the body for 800 matras, roughly five minutes. If we consider that the entire body needs this kind of attention, a 15-minute massage is the suggested minimum amount of time. Herbal oils specific to your constitution or current condition are especially good choices for full body massage. Specific oil recommendations for each dosha are listed in the dosha-specific abhyanga sections below. Bhringaraj Oil, Brahmi Oil, and Healthy Hair Oil are especially well suited for scalp massage. Bhringaraj Oil and Brahmi Oil are especially well suited for foot massage. Massaging oil into the human organism imparts a tone and vigor to its tissues in the same manner as water furnishes the roots of a tree or a plant with the necessary nutritive elements, and fosters its growth, when poured into the soil where it grows. The use of oil at a bath causes the oil to penetrate into the system… and thus soothes and invigorates the body with its own essence. These passages make it clear that we should consider our prakriti (constitution), vikriti (current condition) and our external environment in deciding which oils are best for us and how often we should perform abhyanga. While abhyanga is beneficial for most people, there are some who should avoid it. Massage with deep pressure during the menstrual cycle is not advised in Ayurveda, as it can initiate a release of ama (toxins) from deep tissues at a time when the body is already a bit taxed. Some women don’t like to stop abhyanga during their cycle because they have very dry skin. If you choose to do it during your cycle, it is best to apply the oil gently and for only about 5 minutes. The reasoning is similar here. It is not a good idea to stimulate any sort of detox process during pregnancy. This precaution protects the growing embryo and fetus against any unnecessary exposure to ama. (Or do so only with the knowledge and consent of your health-care practitioner). A thick, white coating on the tongue often indicates high levels of ama. (Unless your health-care practitioner says it is okay to do abhyanga). You should not experience any uncomfortable effects with or from abhyanga. In the unlikely case that you do experience some, if you are not sure whether you should be doing abhyanga, or if you don’t know which oil to use, it is important to consult with an Ayurvedic practitioner. Provided you do not have any of the above contraindications for abhyanga, it is time to learn which oils would be best for you. Ayurveda teaches us that like increases like and that opposites balance, so this decision should take into account the qualities influencing your constitution, your current condition, and the season. First it is good to consider your vikriti – or current condition. If you currently have a dosha that is high, it is beneficial to follow a dosha-pacifying abhyanga for that dosha. For example, if you are nervous, anxious, and you feel cold and dry, vata is likely to be high in your vikriti and using a vata pacifying oil for your abhyanga would be most beneficial. If you are not sure of your current condition, you can take the vikriti test. If none of your doshas are currently out of balance, it is good to consider the dominant doshas in your prakriti – or personal constitution – and your environment, including the current season and weather. For example, if you are feeling healthy and pitta is your dominant dosha, and if the weather is hot and humid (which tends to aggravate pitta) it would generally be best to choose a pitta pacifying oil. If you don’t know your Ayurvedic constitution, you can take the prakriti test. If you have more than one dominant dosha in your prakriti, you will want to pacify doshas according to season. For example, if you have a pitta-kapha combination, it is generally best to pacify pitta during warm weather and kapha during cooler weather. If you are a pitta-vata combination, pacify pitta during warm weather, and vata in cooler weather, and during the change of seasons. If you are a vata-kapha combination, pacify vata during cold and dry weather and during the change of seasons, and pacify kapha during cold and wet weather. More extensive guidelines for each dosha are outlined below.